A "Winter's Tale" Start To New Year For Eastern U.S. The ECMWF operational model forecasts two very strong and cold storms to impact the Northeast as the New Year gets underway. Shown above is the 120-hour forecast at 500 mb and the surface valid at 00 UTC on Friday, January 3rd, 2014. Graphic below shows the same forecast fields valid at 00 UTC on Monday, January 6th, 2014. What a 1-2 punch of a forecast. 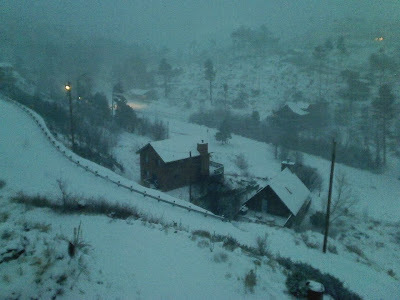 Meanwhile, here in the Southwest, I have to look back to 2012 when we had a cold, winter storm to end the year. The photos above and below were from Art Douglas showing his place in Ash Canyon on the morning of the 31st. Nothing like that this year. Frigid Conditions Over North-Central U.S. Surface observations (above) at 7 am MST this morning, December 29th. Temperatures in southern Canada and north-central U.S. sitting at -20 F and colder. 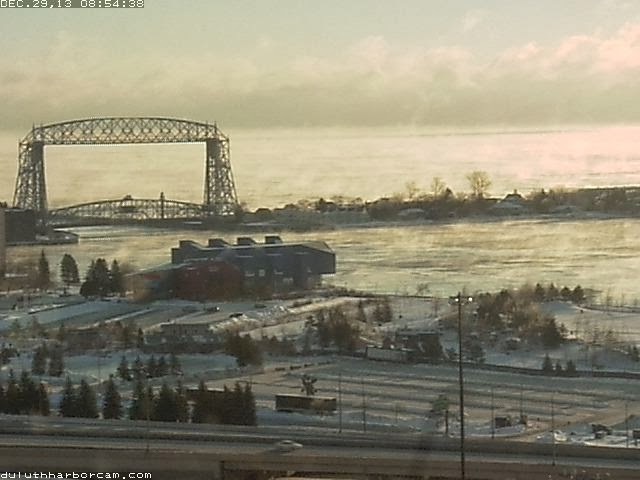 Below is current view of the Duluth, Minnesota, harbor. 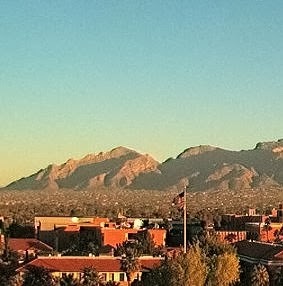 Makes southern Arizona very tempting. 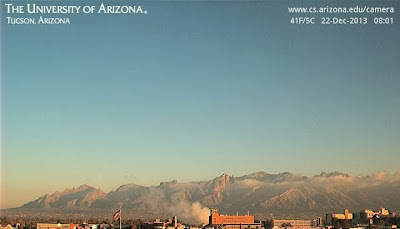 The year 2013 is coming to an end here in southeastern Arizona with a whisper wrt the weather. We are reduced to watching the temperature and also cloudiness. 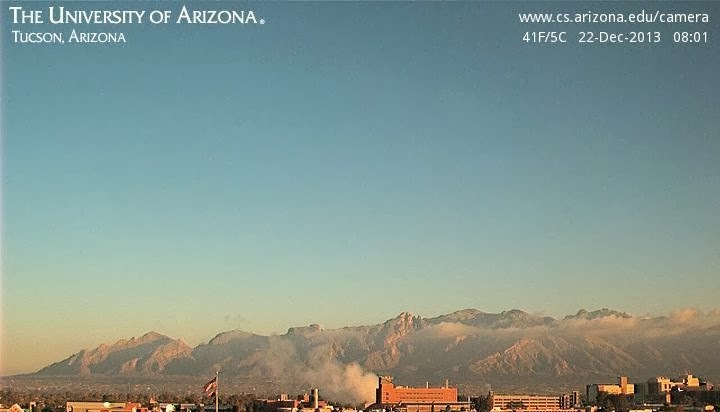 The forecast may be for sunny skies today (Saturday, December 28th), but it looks like a band of high clouds from the eastern Pacific will move across the state today. 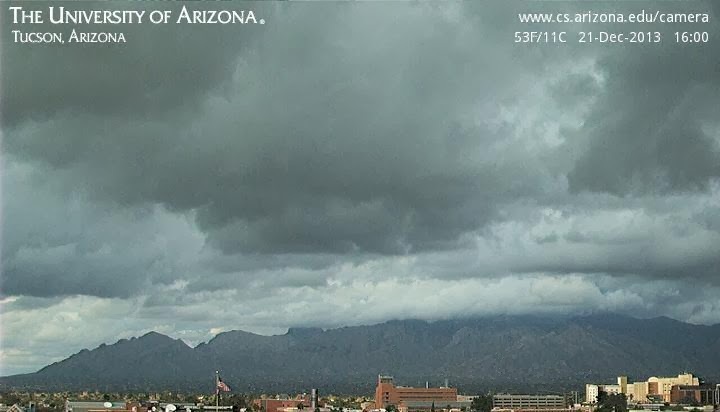 This comes after 5 consecutive days during which the campus web cam didn't show even a hint of clouds. Above is the 7 am MST water vapor image from this morning, which shows a band of high clouds extending from an upper disturbance (at about 20 N and 140 W) northeastward across the western U.S. The early run of the WRF-NAM at Atmo forecasts much diminished incoming solar radiation during the afternoon (graphic above is valid at 3 pm today) and enhanced outgoing long-wave radiation (below is OLR forecast valid at 5 pm MST). Both forecasts indicate a very distinct back edge to the band of high cloudiness. Low here this morning (27 December, 2013) was 29 F with calm winds. 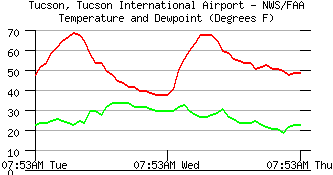 This versus a low of 45 F at TUS, where east winds continued through the night. MILWAUKEE — In a state whose license plates advertise it as America’s Dairyland, where lawmakers once honored the bacterium in Monterey Jack as the state’s official microbe and where otherwise sober citizens wear foam cheesehead hats, road crews are trying to thaw freezing Wisconsin streets with a material that smells a little like mozzarella. This month, Milwaukee began a pilot program to repurpose cheese brine for use in keeping city roads from freezing, mixing the dairy waste with traditional rock salt as a way to trim costs and ease pollution. Local governments across the country have been experimenting with cheaper and environmentally friendly ways of thawing icy thoroughfares, trying everything from sugar beet juice to discarded brewery grain in an attempt to limit the use of road salt, which can spread too thin, wash away and pollute waterways. Snow science experts say an attempt to recycle the salty brine that flavors cheese was only a matter of time, particularly in a state like Wisconsin. What will it smell like after the first really warm thaw? The last three mornings here at the house have been quite frosty and cold with lows of 27 F, 25 F, and 26 F on Christmas morning. However, gusty east winds began yesterday afternoon. 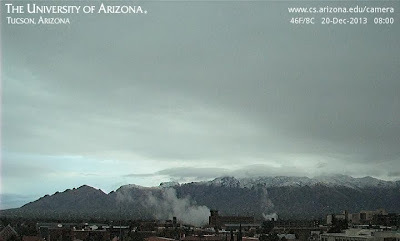 The first web cam shot from campus this morning (above at 8 am MST) shows east winds blowing there right after sunrise. The gusty winds continued through the night at the airport, resulting in a mild morning down there - time series below shows that minimum this morning was more than 10 F warmer than that on Christmas. Here at the house the winds went calm during the night and temperature was down to 36 F before sunrise and headed toward another below freezing low. But, around 7:15 am the east winds broke through and the temperature jumped up to 50F - so ends the string of several below freezing mornings here in the Rillito bottoms. 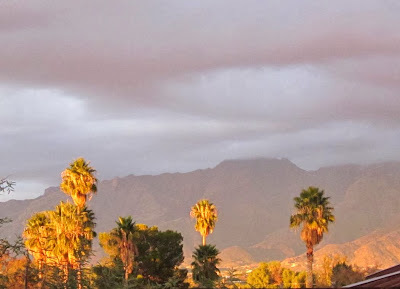 Yesterday afternoon was mostly dreary and raw, with cold west to northwest winds and heavy cloud cover, laced with a few spits of rain here at house. However, near sunset the sun peeked through under the clouds, lighting up the trees just to the north. 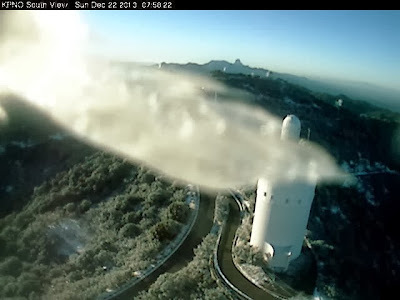 This morning has dawned clear and frosty in spots - at 8 am MST here at house temperature sits at 30 F. Out at Kitt Peak ice on the web cam that looks south toward Baboquivari Peak has created an interesting effect - below. Jack Hales made the video above from the web cam images at Computer Sciences. Very interesting and many thanks to Jack. 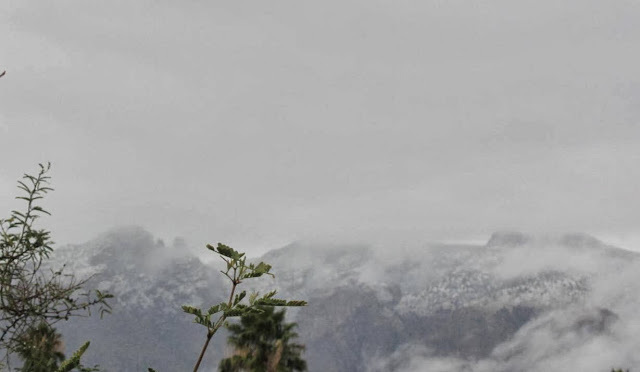 Photo of Catalinas taken a bit after 7 am MST yesterday morning (Friday, December 20th) just as the first and most significant precipitation period was ending here at house. 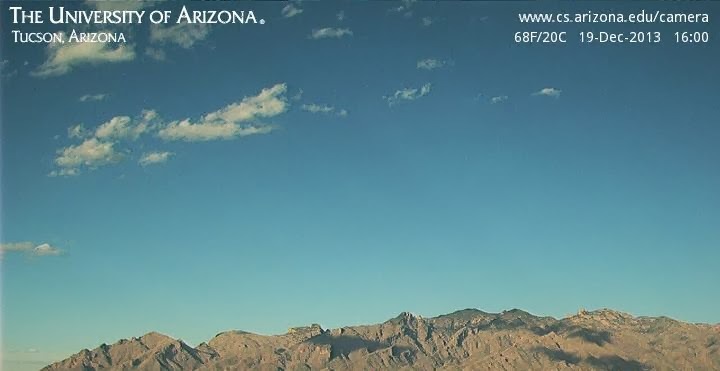 It looks like the snow level had dropped down to about 5500 ft MSL, or a bit lower (elevation of Finger Rock is 6475 ft at left side of photo). View from Computer Sciences webcam at 8 am - shows the lower elevation snow was melting quickly. 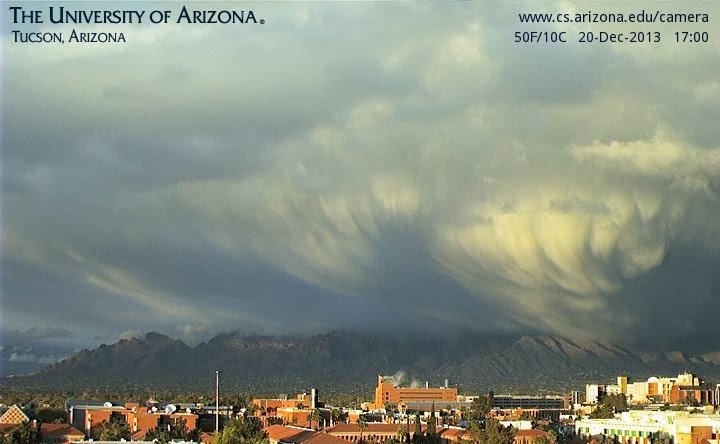 Again from Computer Sciences - dramatic storm clouds over the Catalinas at 5 pm with snow streamers and even some ragged mammatus. 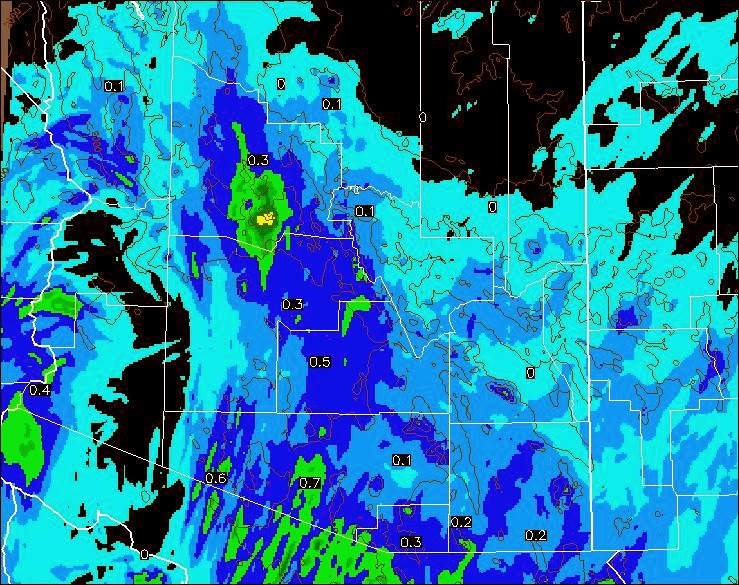 I took a look at the ALERT rainfall for the 30-hours ending at 6 am MST this morning - above is the metro east sector. The heaviest rainfall during this event maximized over Redington Pass region between the Catalinas and Rincons. Don't know about what the total was at highest elevations because of the mixed character of the event. 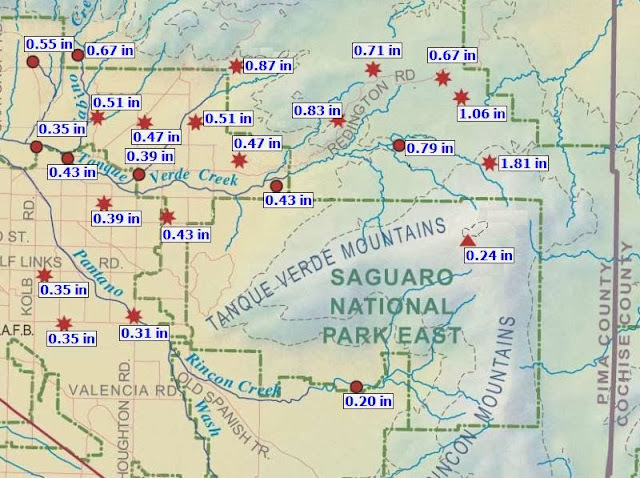 Amounts across low elevations of the metro area (west sector shown below) ranged generally 1/10 to 4/10s of an inch. the QPFs shown in an earlier post appear to indicate (from a quick, subjective appraisal) that the WRF-GFS was closest to forecasting observed amounts, while NAM version was too light and NWS QPF was too heavy at lower elevations. Here at the house we had 0.34" in the first and only significant period of rain; followed by some light showers before noon that added 0.03"; with some more showers after dark adding another 0.03" - so a total through 6 am on the 21st of 0.40". Cloudy skies and more sprinkles during the night kept temperatures across the metro area mostly up in the 40s F (morning low at airport only dropped to 45 F, although here at house it's currently 38 F). Edited to add webcam image from Mt. Lemmon at about 7:30 am. Break in rain here at 7:30 am let me peek at rain gauge which has caught 0.34" so far. Rains moved into eastern Pima County around 4 to 5 am MST this morning. By 6 am 100% of the stations in the ALERT network had already measured rainfall - with snow apparently falling at the high elevation sites. Too ugly to go read the rain gauge here at house. 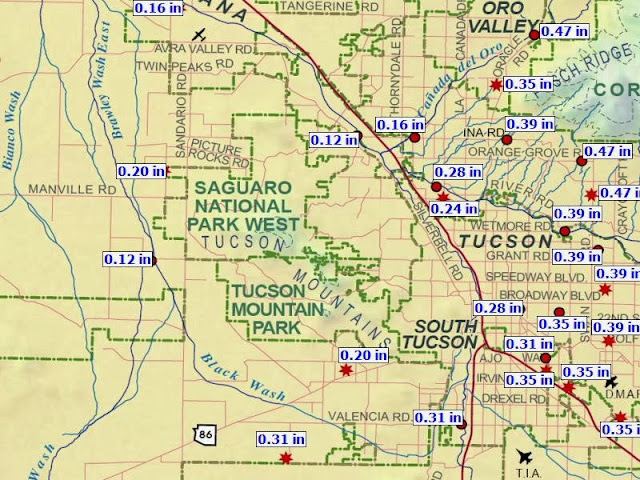 Above is Tucson composite radar echoes a bit after 6 am and below is the metro and west sector of the ALERT network showing rainfall through 6 am. More later. 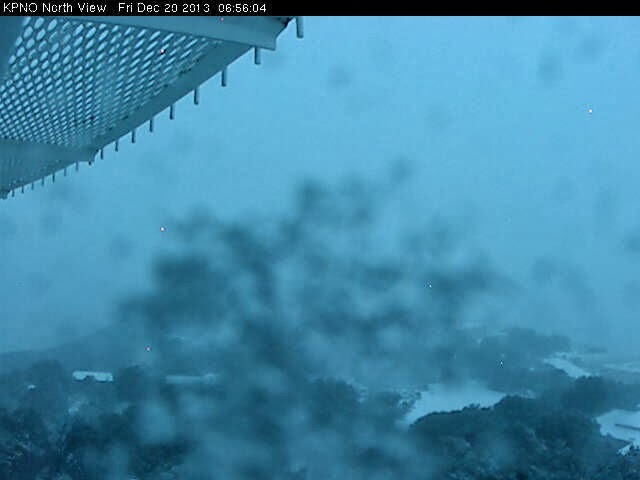 Kitt Peak web cam at a bit before 7 am shows that snow level has fallen below their elevation (6875 ft MSL). By 4 pm MST this afternoon some clouds were starting to come in from the southwest - above. Forecasts of total precipitation through 8 am MST on Saturday the 21st - WRF-NAM above and WRF- GFS below. The GFS version appears to be wetter than the NAM version, particularly over eastern Pima County and across north-central Arizona. 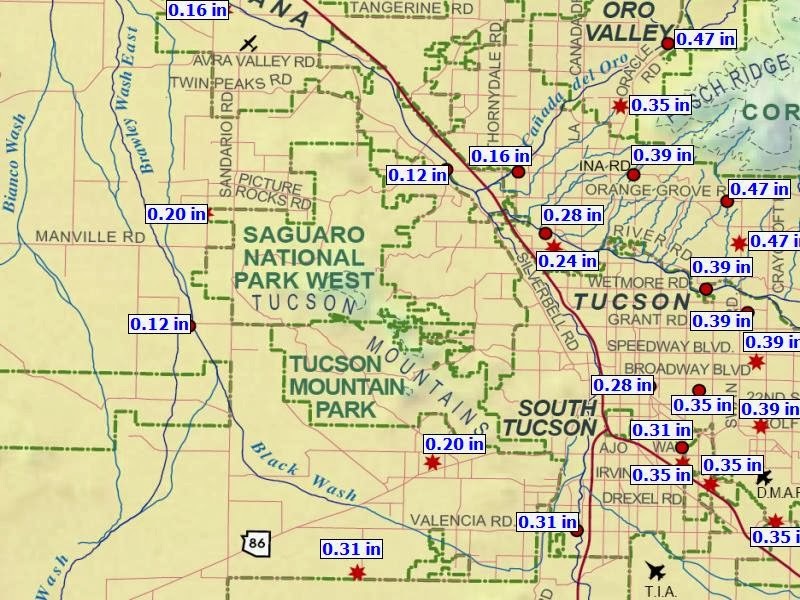 The QPF forecast from NWS Tucson this morning appears a bit wetter than either of the model forecasts - below. Finally, below is the surface forecast from the WRF-GFS valid at 10 am MST tomorrow morning - looks like a fairly dismal start to the day. First - the diurnal temperature swing yesterday was around 55 F - low here at house was again 28 F and high at airport reached 83 F - which was a record high for the date. The short wave at 500 mb that will dig southward during the coming 48 hours is currently over western Canada and the Pacific. Upper-air data this morning indicate that temperatures in this wave are currently quite cold - at minus 39 C or colder. The early WRF-GFS model run from Atmo this morning extends through 11 pm MST Friday night the 20th of December. Above is WRF-GFS forecast of composite radar echoes valid at 1 pm MST on Friday afternoon, while graphic below shows the model's forecast of total precipitation through 11 pm Friday night. 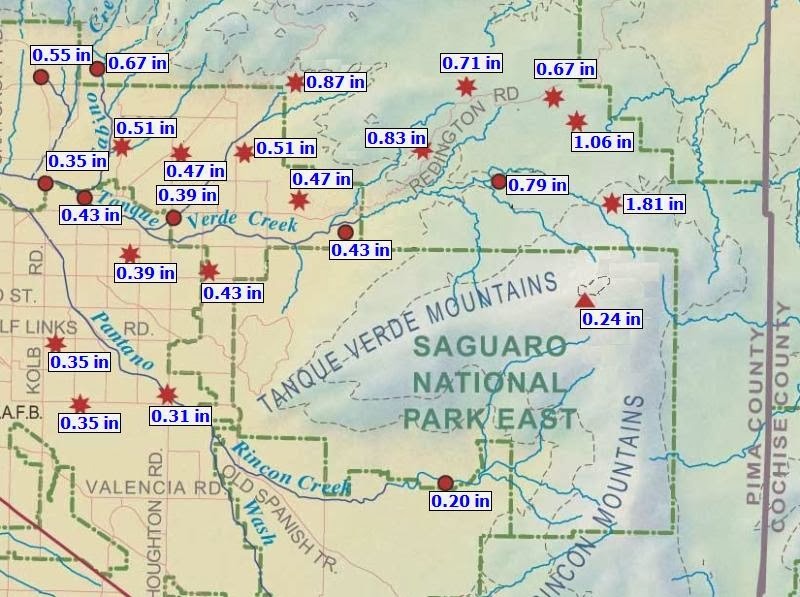 The model forecasts a broad maximum of precipitation (through late Friday night) to occur from north of Phoenix, southward across central and western Pima County, and into northwestern Sonora. This morning's run of the NWS NAM model is considerably different than the midnight run of the WRF-GFS. That model forecasts very light rainfall through 11 pm MST Friday night across most of southern Arizona except for the far southwest and the southeast corner. 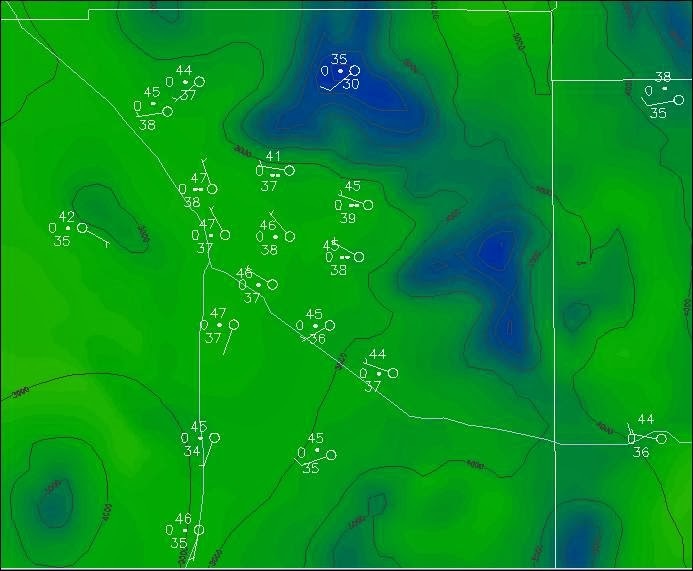 The surface plot forecast by the WRF-GFS for noon on Friday indicates a cold, rainy, and dreary day for metro Tucson. Final note is that the 500 mb spaghetti plot from the GFS model ensembles (below) valid at only 72-hours continues to show largest uncertainty from the east Pacific across the Southwest. This means that timing and duration of the coming weather event may be a bit difficult to forecast exactly. The low here at the house yesterday morning was 28 F, while the high at TUS (the Tucson airport) reached 78 F. A diurnal range over some parts of the city of about 50 F. Looks like more of the same today. For the weather event coming at the end of the work week, I'll again concentrate on the 500 mb forecasts from the global models. The ECMWF (above is 500 mb forecast valid at 5 pm MST Friday afternoon the 20th of December) continues to be very progressive with the short wave, moving it to west Texas by that time and also continues with a weaker, trailing short wave. The GFS has become somewhat similar in the model runs last evening. Graphic below shows one of the GFS members (valid times are all the same here) that is similar to, and even a bit faster, than the ECMWF. Three of the GFS ensemble members continue to be distinctly different, forecasting a deep, closed low holding to the west along and off the coast of northwest Mexico - see above. The GFS 500 mb spaghetti plot valid at this time is shown below. The spread of the forecasts is greatest from west of Baja northeastward across the Central Plains. The height differences between the two GFS members shown here is as great as 250 to 300 m west of Baja. Regardless, 10 of the 12 GFS members forecast precipitation over southeast Arizona for the 12-hours ending at 5 pm Friday. So the models indicate a decent chance for a second December precipitation event before the year comes to an end. The longer-range global models continue to have considerable differences. I've been able to take a look at the 144-hour, 500 mb ECMWF forecast from 00 UTC last evening, valid at 5 pm MST on Saturday, December 21st - above. The ECMWF forecasts a progressive short wave across the Southwest, with a weaker trailing wave. The same forecast from the GFS operational member - below - is similar, but with the leading short wave digging deeper into Mexico. However, a number of the GFS ensemble members close the system off, dig it to south toward or west of Baja, and move it much more slowly. Forecast below is from one of those ensemble members and is quite different than the two shown above. At this time 5 of the GFS members forecast a progressive short wave and 7 members forecast a deep, closed and lingering low at 500 mb. It has been a difficult fall and early winter for the long-range global forecasts with many cases of low predictability. The ECMWF has appeared to keep its advantage over the GFS, but not to a very high degree as has been the case in some winters. We will have to watch as this interesting scenario evolves this week. Sunset colors on the Catalinas the evening of Sunday, December 15th. 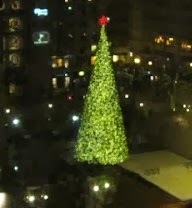 We have been away in San Francisco for several days and are now back in Tucson. Interesting trip with perfectly clear and dry skies on flights on the 10th. Have never before seen the lights of both Los Angeles and San Francisco so bright and clear on the landings. Delays coming back on flight from Los Angeles to Tucson. Looks like the week before Christmas may have an interesting few days as the global models predict a significant closed low off of northern Baja by Thursday and Friday. The GFS ensembles are forecasting precipitation in 9 or 10 of 12 members for several periods late Thursday into the weekend. The last round of the great ice storm that began last Thursday has moved into the Mid-Atlantic region and the Northeast this morning (Monday, December 9th). 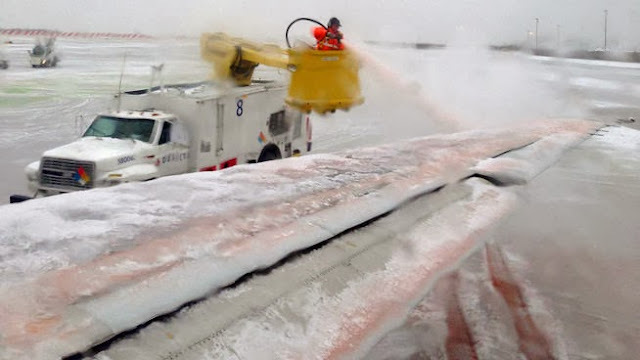 North Texas was hit hard on Thursday and Friday - CBS photo above was on Friday afternoon and shows de-icing efforts at DFW. 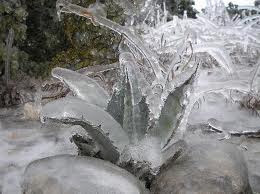 Photo below had no details as to which day and where in Texas - but it shows an agave encased in ice. Thousands have been stranded and last night about 650 travelers were still sleeping in the terminals at DFW. Morning headlines on the local CBS station indicate that these folks may finally escape today from their forced visit at DFW. Very glad not to have been one of them - during my NOAA career I flew through DFW hundreds of times, but was never stranded - some long, long delays but never overnight. 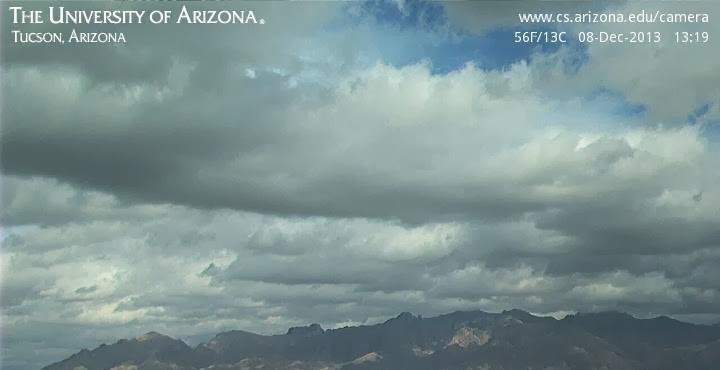 Skies have been mostly cloudy today as the broad trough at 500 mb continues to affect southern Arizona (current view of Catalinas above). The surface observations for TUS (below) indicate that low clouds and overcast skies have prevailed since about 4 am this morning. The clouds kept low temperatures about 10 F warmer than were observed yesterday (34 F here at house this morning compared with 23 F yesterday morning). Bottom graph of solar radiation at Atmo shows the dramatic difference yesterday to today.